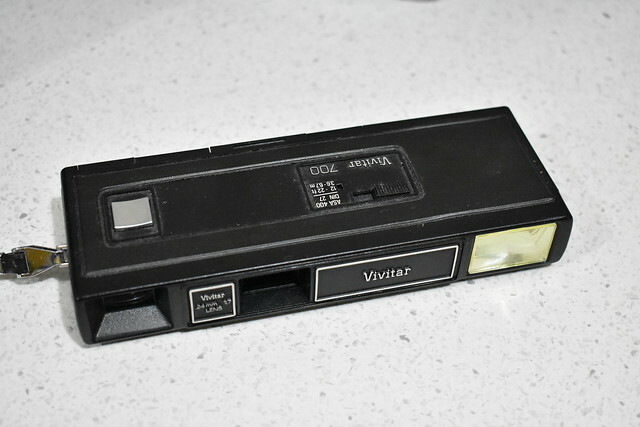 The Vivitar 700 is one of many cameras for the successful 110 film format. It has a 3-element glass lens (by comparison, a lot of 110 cameras had a plastic lens), and has a built-in electronic flash (via two AA batteries). It appears to date from the late-1970s, and has a typical shape seen in 110 film cameras of the period. Two alkaline AA batteries are needed for the flash, but otherwise the cameras works without batteries. It has a fixed-focus lens (5 feet/1.5 metres to infinity). It accepts both 100 and 400 ISO film. Example photo by Phillip Pessar taken using this camera and modern Lomography brand "Orca" black-and-white film on Flickr. This page was last edited on 6 September 2018, at 07:58.